Boy, we sure wish you were aboard for our one and only Whale Watch Cruise on Tuesday (and if you were, good choice)! 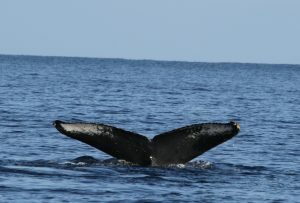 Guests on our Wake up with the Whales Cruise got to watch a lone Humpback for about an hour. At times, this whale surfaced just 25 yards from our idling boat. We even got to see the white tail patterns on his flukes close-up when he decided to sound near us. While we were watching this whale, we were listening to some others through our hydrophone. Based on the volume, we knew they were close-by, but we never got a glimpse of any of those singers. Ocean Sports Whale Fact of the Day: Though we’ve mentioned before that only male Humpback Whales “sing”, all Humpbacks make noises and apparently use these sounds to communicate with each other. Researchers have witnessed cooperative feeding behaviors among the Humpbacks apparently “triggered” by sound, and have also witnessed Humpback Cows (moms) apparently ignoring some sounds made by their calves, but responding immediately when the calves made particular grunting noises accompanied by jaw claps or bubble blowing. So it appears that Mom both recognizes and reacts to her baby’s voice! You can read more about this research here.